Did you know that the majority of the air pollution and greenhouse gas (GHG) emissions and a significant amount of water used across the City of Orlando comes from powering our buildings? In order to address this problem, we have made a commitment to shift away from energy that is generated through the burning of fossil fuels towards investments in clean, renewable energy. We’re also seeking out ways to make our buildings more energy efficient – meaning that less energy and money is wasted through the process of powering the building – and encouraging green building practices. By pursuing these goals, we will curb waste, save businesses and residents money, boost the local economy, create new jobs, and support a cleaner, healthier environment. We plan to make The City Beautiful more accessible towards energy and renewable resources, by these targets and goals. UPDATED (5/31/17): Mayor Dyer has joined more than 120 other mayors from across the country as part of the Sierra Club’s Mayors for 100% Clean Energy and has committed to 100% renewably-sourced energy by 2050. As part of the Better Buildings Challenge, the City is undergoing $17.5M of energy efficiency upgrades at 55 of our buildings, which will save us up to $2.5 million per year – freeing dollars that will help pay for the cost of the new police headquarters currently in construction and can be invested in our parks, public safety services and youth programs. In order to direct our focus to the buildings that need improvements or attention in real-time, Orlando uses Lucid BuildingOS, a specialized software to measure and monitor the energy and water consumed by all of our City buildings. 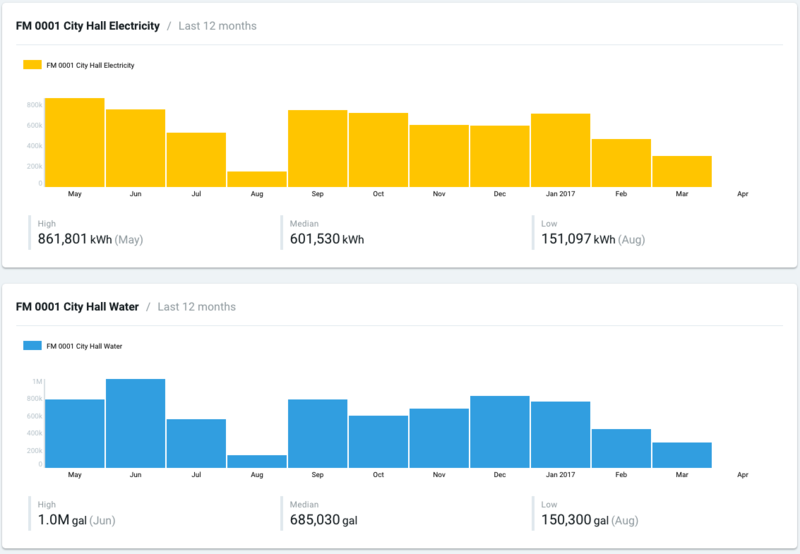 This information will be used to manage our buildings’ performance, compare how we’re doing with 100 other forward-thinking cities as part of the Connected Cities initiative. 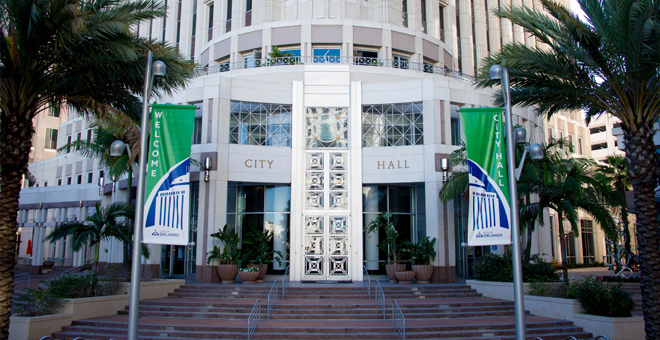 Since 2007, the City has committed to meeting LEED (Leadership in Energy and Environmental Design) standards for all newly constructed City buildings, reflecting a commitment made by over 400 other local governments. LEED is a voluntary green building certification program that requires energy and water efficiency and sustainable materials and construction practices. 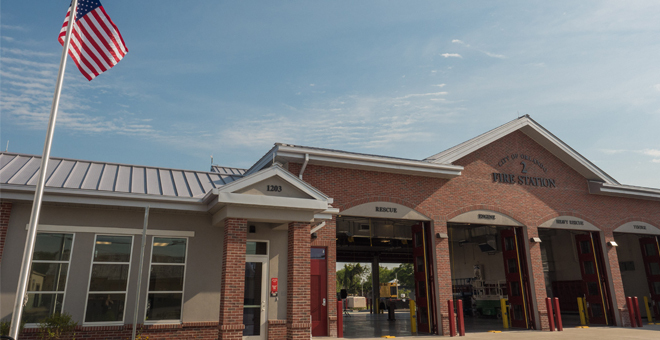 One of Orlando’s early successes was to build the first LEED-certified fire station in Florida. Several buildings ranging from fire stations to community centers to the Amway Center and City Hall have been undergoing renovations to save energy and taxpayer dollars. Many of the retrofits comprised of advanced controls (proudly made in the USA) that allow facility managers to track energy consumption in real-time and to receive notifications when large systems like chillers or condensing units are using an abnormal amount of energy, enabling facility staff to quickly fix problems. Other measures included replacing air conditioning equipment that was at least twelve years old and initiating LED-replacement programs for the 50,000 residential streetlights in the city. In December 2016, Mayor Dyer and City Council unanimously passed the BEWES policy, which is focused on helping building owners and managers understand their building’s energy performance through benchmarking and identification of the technical and financial resources available to implement energy and water efficiency measures. Upon citywide implementation beginning in August 2018, this policy will help cut energy waste, save money for tenants and building owners, create jobs, reduce harmful pollution, and create a greener future for generations to come. Through the U.S. Department of Energy's Better Communities Alliance, Orlando has joined dozens of city and county leaders who are making commitments to reduce the wasted energy in homes and buildings, expand renewable energy and sustainable transportation options for their residents and businesses, harness new energy-saving technologies, and invest in resilient power systems and community infrastructure. The City Energy Project is a national initiative to create healthier and more prosperous American cities by improving the energy efficiency of buildings. Working in partnership, Orlando will develop innovative, practical solutions that cut energy waste, boost local economies, and reduce harmful pollution. Provides a unified voice for professional and trade organizations, local government, academia, and utilities, who are committed to research, education and implementation of environmentally and socially responsible energy and building management practices that conserve energy and natural resources. Beginning fall 2016, the City of Orlando will provide a new set of financial tools to home and business owners to help them lower their utility bills and make our buildings more energy and water efficient through the Property Assessed Clean Energy (PACE) program. PACE removes the barriers of high upfront costs and provides low-interest financing to help residents and business owners looking to modernize, mitigate wind damage and improve the energy and water efficiency of their property. The City is proud to sponsor the Solar & Energy Loan Fund (SELF), a nonprofit community lending organization providing favorable financing for assorted home improvements that can help save money, increase equity and home value, improve hurricane resistance, and enhance comfort and livability. If you are an OUC electric customer, their experts can show you how to save energy and reduce your monthly utility bill with a free Home Energy Survey. A trained energy specialist will give your home a thorough examination, inspecting all areas for energy and water loss, and identify opportunities to save through rebates, incentives, and on-bill financing. The quickest way to save energy on home cooling is to regularly clean and replace your cooling unit's filters. Install and set a programmable thermostat - it could help you save up to 10 percent (or up to $150) a year on heating and cooling costs when used properly. Use one that can automatically turn off your cooling system when you are not home, and turn your system on in time for you to arrive home to a cooled house. Use a fan Ceiling fans will allow you to raise the thermostat setting about 4 degrees without impacting your comfort. Just make sure to turn it off when you leave the room (fans cool people, not rooms). Insulate your attic and walls, and seal cracks and openings to prevent warm air from leaking into your home. Call OUC for a free Home Energy Survey: 407-423-9018. Insulate and seal ducts -- air loss through ducts accounts for about 30 percent of a cooling system’s energy consumption. Call OUC for a free Home Energy Survey: 407-423-9018. Lighting makes up about 10 percent of home energy costs. Save up to 75 percent of that energy by replacing incandescent bulbs with light-emitting diode (LED) bulbs. They also last longer, saving money on replacements. Install energy-efficient window coverings that let natural light in and prevent solar heat gain.If costs weren’t enough reason to make the switch to LEDs, only about 10 to 15 percent of the electricity that incandescent lights consume results in light -- the rest is turned into heat. Well-planned landscaping isn’t just for aesthetics -- properly placed trees around the house can save between $100 and $250 annually. Visit OnePersonOneTree.com to use an interactive mapping tool that will show you how much a tree can help you save. Buy an ENERGY STAR-qualified AC unit -- on average, they're up to 15 percent more efficient than standard models. Use the bathroom fan when taking a shower or bath and a range hood when cooking -- this helps remove heat and humidity from your home.